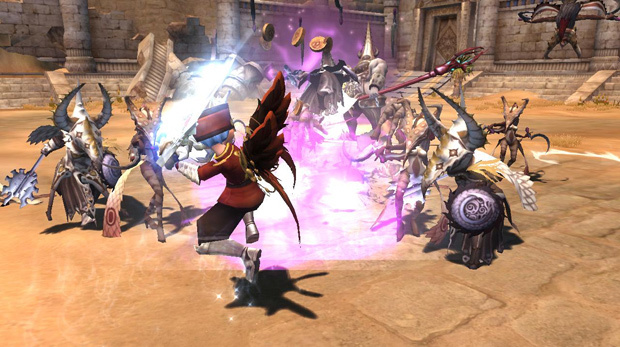 The action MMORPG Dragon Nest Europe shows its playful side with a new pirate mini-game in which players sail across all of Althea to find a pirate king’s hidden treasures in the Continent Expedition. Old foes get a new makeover in the new dungeon Deceptive Stronghold, where level 40 Nests relive their former glory as new level 60 Nests. Running dungeons has never been more fun than in Pirate King Loffy’s Continent Expedition. Tracing the steps of bygone adventures, players have to complete missions in areas Loffy once explored. Once the die is cast, Loffy will set sail for a bold adventure players have to face to obtain golden keys that will unlock his treasure chests. The chests contain pirate accessories like a tricorn with a parrot on top or even Dark Fairy Wings. The dungeon game is not the only dungeon being patched this month. Along comes a revamp of the level 40 Nests old players hold dearest and new players never experienced as a tough challenge. Patching a revamped level 60 version, Shanda Games International Europe reintroduces the Cerberus, the Manticore, the Apocalypse, the Archbishop and the Gigantes Nest, which can be accessed through the Garden of Space and Time. For the first time in Dragon Nest Europe, pets can also talk and actively engage in fights. The brand-new Manticore Pet and its cheeky comments will certainly test its owner’s patience. Just in time for this year’s heat wave, a chic collection of summer beach-wear has been added to the Cash Shop and also includes a coupon for yet another costume set. Finally yet importantly, the playable characters also get a completely new makeover with various new hairstyles, eye colours to choose from, and rare grade accessories. Wargaming is pushing the boundaries for the military simulation genre, and today, they have released new images from World of Warships.